There seems to be a little confusion about whether these cushion foundations are foundation or BB cream. Their names don’t help. Laneige calls theirs a BB Cushion which implies theirs is a BB cream. The other brands I’ve featured call their product a plain cushion… which doesn’t tell us very much. Personally speaking, I categorize cushion foundations as foundation or base makeup. They are basically a light textured liquid foundation in a saturated sponge cushion, that is made portable and easy for touching up. In fact, if you like touching up your makeup, I’d say that cushion foundations are really what you should be carrying, instead of powder foundation. The light liquid texture is more flattering on skin, and when you use it as a touch up, you will get the coverage you need anyway, as it usually goes on top of your existing base makeup. I started out my experiment thinking that most Korean cushion foundations would be similar in texture and performance. After 7 days, I’ve realised that they are just as varied, even if almost all the cushions I featured come from the same mother company! All the cushions on the left – Iope, Laneige (Pore Control and Whitening), Hera, Mamonde, Innisfree and Sulwhasoo are all brands under the Amore Pacific brand. Iope featured in my previous CFW but I’ve brought it back because it is a Korean brand after all! The one that’s different, and the black sheep, is April Skin, which doesn’t come under the Amore Pacific umbrella. However, as you have seen over the week, the quality and performance of the cushions within the same umbrella brand are all quite different. I also realised, as I’ve said above, that Korean brands move very quickly, and reformulate often, with confusing names and descriptions. So I cannot be sure that a product called Water Glow Cushion is the same as Water Fit Cushion (by Innisfree) or that the Hera UV Mist Cushion that has no description on mine, is the same as the Hera UV Mist Cover Cushion now available on the website. I don’t know, and I probably won’t know since we don’t have Hera here. Needless to say, the sun protection offered by all the Korean brands are very high. This is impressive and really sets the standard for base makeup that is functional. Most, if not all of them use Titanium Dioxide and Zinc Oxide as their UV blockers. If you use enough therefore, theoretically, these would make excellent sunscreen touch up products. Not as a primary protection, but for touching up through the day. Because I cut my cushion foundation teeth on Laneige back in the day, I had the impression that all Korean cushion foundations come with refills. All the compacts have 15g of product if I’m not mistaken, and including a spare refill usually brings it to 30g, that is a more common size for foundation. However, I was very surprised therefore to note that it wasn’t the case. Ironically, it was the cushion foundations in the more affordable brands that did away with the spare refills. I found that surprising, but at the same time, clever. By not packaging their product with a spare refill, the brand could reduce the price of their product, thereby giving the impression of affordability. If a cushion foundation set would cost e.g. RM159 for a case + 2 refills, and the brand could sell you a case + 1 refill at RM90 it gave the impression you were paying less. In fact, you end up paying more in the end. For this reason, I found myself a little prejudiced against Innisfree and April Skin. While this also meant I didn’t have to slog through a 2nd refill of a formula I did not like, it did not give me the perceived value. Once I buy the product + refill, the price would essentially be the same as, or maybe even higher than a mid-high range brand. However, as most of the brands are under the same umbrella, I did note in the individual reviews that some of the cushion refills fit into some other brand’s cases. Mamonde, Hera, Sulwhasoo and Iope are all interchangeable in that the refills fit into any case from any of these listed brands. I do not know however, if any new packaging would impact this, so this information is current based on the products I now own. I cannot compare the prices for you, because these Korean brands have different prices, depending on where you buy them from. There are many websites you can frequent, that offer Korean brand cosmetics at a lower price, so naturally you will then get a bargain. I can’t tell you where to shop as Korean cosmetics aren’t really my thing, so you will have to do your own research. For the most part, I found the sponge puffs to be of very good quality, and of similar construction i.e. a sponge puff with a rubbery surface. This rubbery surface actually acts rather like a beauty blender, for those of you who use it, and you use it the same way i.e. bouncing it against your skin. I do find that the pat and roll technique is more effective to get the product to adhere to your skin and offer better coverage. However, as I had also noted, not all the sponges are equal. April Skin’s sponge puff was a little inferior for the product, I felt, as it did not apply it very evenly on my skin. When I switched to a better quality puff from Laneige (whose puffs are lovely with a nice rubbery bounce to the surface), the product applied much better. The Amore Pacific brands had generally good quality puffs. Some were softer than others, but the surface density was nice, so it offered a nice bounce to the skin, as well as transferring product nicely without streaking or going on patchy. However, I don’t think puffs are sold separately for most, although Innisfree often gives them out as free gifts. The cushion quality too varied. Laneige in their 2016 version of their BB Cushion has come up with a rather dense and raised textured surface which might herald the future appearance of cushions. 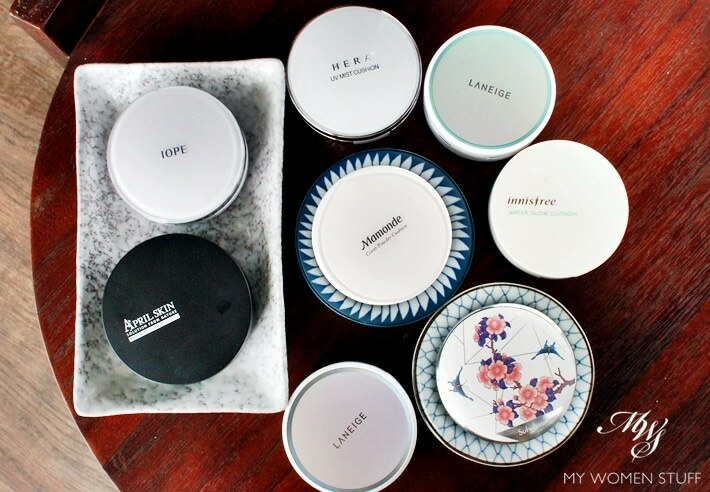 I have noticed that Laneige is more at the fore-front of cushion technology, as compared to the other AP brands. Their sponge puffs are certainly of very high quality. Hera, Iope, Mamonde and Sulwhasoo had a similar texture to their cushion with a little give. I found that the surface may appear to dry out quickly with regular use, but there is a lot of product if you depress your sponge into the cushion. As all these apply very evenly and are lightweight on skin, you don’t need very much to achieve an even toned look. April Skin had a different style cushion, which is slightly domed and does not come saturated with product. Love it or hate it, it’s up to you! Those of you familiar with my style here at MWS might be wondering why I did not have swatch comparisons in each individual review. The reason was because I felt it was better to show all the brands side by side. I realised from previous experience that comparing them with other types of foundation didn’t make a lot of sense. The texture of the cushion foundation varied. Some were lightweight, some felt heavier on skin and more tacky. Which you like will depend on your tolerance, and whether you set your foundations with powder. I personally do with anything liquid or cream that goes on my skin. It just looks better. But it depends on how you like it. Here are how the different shades I have tested swatched against each other. If you want to see how they look on the face, the before-after photos are in the individual review posts. Isn’t it interesting that they are ALL in shade #21 but look so different on my skin?! I’ve made these swatches by dipping my finger in the cushion, pressing down and swatching just once down my arm. I’ll just quickly break them down for you in summary – you can read the fuller version in the individual posts. 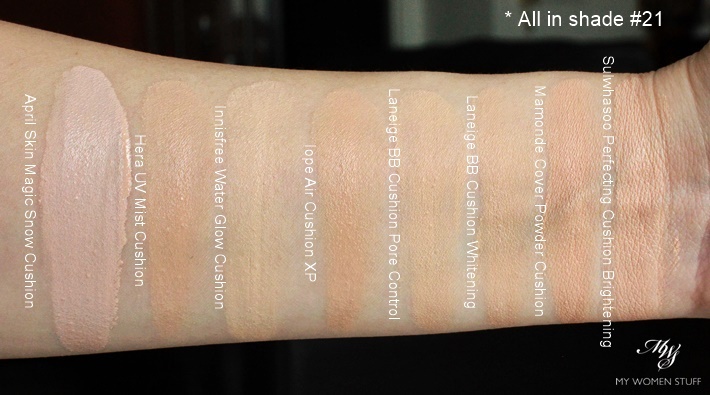 Iope Air Cushion XP – Shade-wise this is similar to Hera with a slight peachy but neutral tone. The coverage is actually a little lighter than Hera but the texture is similar, drying down semi-matte on my skin. Laneige BB Cushion Pore Control – The shade is a little light, and a little yellow toned. However, the texture is lightweight and a little sheerer than Hera. It dries on skin semi-matte and I find it gives me low-medium coverage which I find comfortable. Laneige BB Cushion Whitening – The shade is similar but I find that the texture is sheerer on skin and remains tacky. I also find that the coverage is less compared to the Pore Control. You can’t tell from a swatch of course. 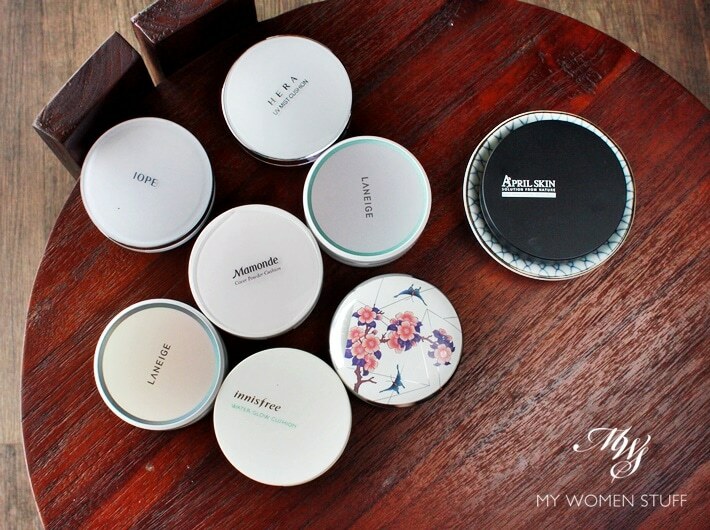 Mamonde Cover Powder Cushion – You can tell that this one’s high coverage. Yet, it looks lighter when compared to April Skin. I find you can sheer out Mamonde, but you can’t with April Skin. The shade is a peachy tone, with a fairly neutral base, but definitely peachier in tone than Hera or Iope. Sulwhasoo Perfecting Cushion Brightening – True to its name, I find that although it has a peachy tone, it has a more brightening effect. The coverage is medium but it looks lightweight in the swatch, with some transparency to it, the same with Hera and Iope, the other cushions I like. It’s actually a little mind boggling how or why the shades are so different when they are all the same code. I didn’t notice how significant it was till I did this comparison! On the subject of shade selection, I must say that for the most part, those will deeper skintones will be frustrated when shopping Korean brands. More global brands like Laneige and Sulwhasoo have introduced slightly deeper shades to their line up. But brands that are Korea or Asia based still stick to just 2-3 shades, mostly in the lighter end of the skintone spectrum. All the cushion foundations tested had a scent. Some were more bearable than others, but Koreans like scent in their cosmetics. I wish they’d remove the scent though. I mean, Clinique managed to do it! Korean Cushions: Do I like them and which is my favourite? The fact I managed to do 2 Cushion Foundation Weeks is quite a feat considering I used to hate cushion foundation, finding them gimmicky and fussy. But having experienced quite a few so far, and those of better quality, I can understand why and how they may be used, or how I may use them. I have also found it particularly useful to know that I can have better coverage with cushion foundation by employing the assistance of some concealer and powder, and making sure I apply them in the correct manner. The other thing is that I may be appreciating cushion foundation more these days, because my skin is better than it was before, and because I feel more comfortable in my skin now than I did. I can see how they are useful for touching up and for travelling with because you don’t have to risk spillage, and using the layering trick, you get a pretty impressive natural no-makeup look. However, my preference lies with light-textured formula that have a semi-matte finish on skin. In a hot and humid climate where I glow (read: sweat) without even trying, having a “dewy glow” on my face is hardly my impression of a healthy visage. While I think the Korean cushions are superior (they have been aggressively innovating after all) they are not made equal. 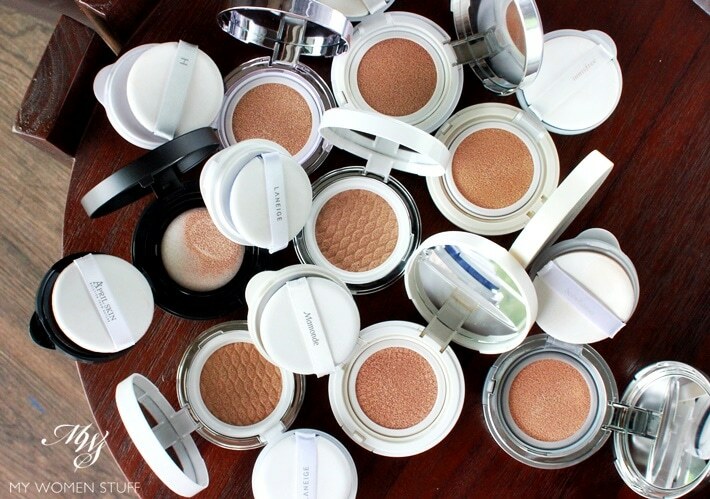 Also, unless you are a K-beauty fan and know where to shop for Korean cosmetics, it’s actually quite hard to get the better quality cushion foundations (in my view) outside of Korea. Deeper skintoned gals will have a problem having a colour match as well, which is big disadvantage. 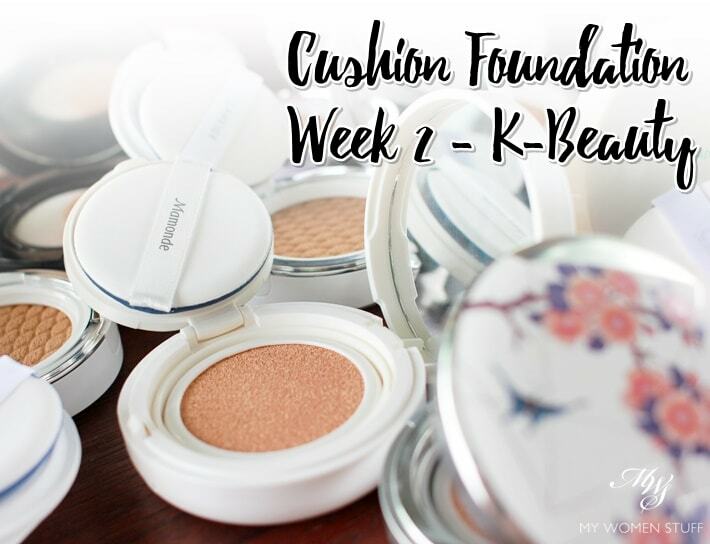 Do you use Korean brand cushion foundations? What are your favourites? PREVIOUS POST: Cushion Foundation Week 2 Day 7: Sulwhasoo Perfecting Cushion Brightening SPF50+ PA+++ made me love cushion foundations! *sheepish* I was tracking every single day, actually – this has been a most awesome reading week! Thank you for all the hard work you’ve put into reviewing; all of these are going to make it a lot easier for me to figure out which BB Cushion I want to treat myself to next. I actually own a Laneige one as of present (the Anti-Aging one), but I’m oh so very tempted by the Hera and Iope ones as of at the moment. Still bouncing between which of the two I should get, oh dear. My country has no access to Korean beauty companies, but I must congratulate you for this hard work. If ever, I will look up to your articles. Big hugs from Greece. You should also post a collage of your full face application here along with the swatches! I thought the Sulwhasoo gave off the most natural finish out of all, even the Hera one. Having all the after full face shots would help bring home the differences even more clearly. I considered the collage Firn, but my lighting was not consistent in all the photos, which could affect the perceptions. Don’t have swanky controlled studio lighting like some people use, unfortunately! I only managed to get the lighting sort of similar in each of the before/after pix which were all done on different days 🙂 Sulwhasoo gives off a bit more glow compared to Hera but I attribute it to the brightening formula. They are both otherwise very good products. Thanks for the Cushion Foundation Week 2. I really enjoyed it and I am now really interested to go over to Sulwhasoo and Laneige counters to test on the shade selections. LOL. Such a great series Paris an d the hard work is appreciated 😉 A friend of mine is living in Korea atm and I have requested that he (yes, he – which means this could get very confusing haha) buy me the Hera and Sulwhasoo cushions 🙂 I did tell him though, to buy me a spare refill, but if they already come with a spare, I probably wont need it will I??? In that case Ill ask for two colours from Sulwhasoo… I also found that researching Korean cushions and colours difficult and did NOT clear up any doubts/questions that I had lol! I’m afraid I have no idea what brand that is but as I’ve indicated in my post, I’m not particularly interested in trying anymore cushion foundations. Perhaps you can try and see how it works for you.